Having defeated Alexander Gustafsson by third-round TKO in the main event of UFC 232 in late December, Jon Jones is once again the UFC light heavyweight champion. And now that he’s reclaimed the divisional throne, it’s time for himto direct his focus to his next title challenger. From the sounds of it, that challenger could be streaking light heavyweight contender Anthony Smith. Speaking on Instagram on Friday afternoon, Jones divulged that he’s currently doing some tape study on Smith. “So much to study, this is going to be fun,” Jon Jones said in the caption for a post that featured Anthony Smith on a computer monitor. This comment from the new champion lines up with some recent comments from Smith, who told FloCombat that he’s ready for his title shot at any time. “I will fight him tomorrow,” Smith said of Jones. “July just sounded cool, you know, with International Fight Week. Also, I thought Jon had a bunch of commission sh*t he had to clear up, so that was just something off the cuff I said. July in Vegas just sounded cool. I will fight Jon Jones tomorrow. Smith also added that he’s spotted some vulnerabilities in Jones’ game. “I’m the only legitimate threat to Jon Jones,” he said. “I’m the only one that’s even got the capability of beating Jon Jones in the entire division. I think that’s gotta be next. I think I’m the next guy. “There’s no one else out there who’s going to give Jon a fight. There’s no one who’s going to threaten him and there’s no one anyone else wants to see him against. Jon fought well [against Gustafsson], he really did, but he looked human. That’s one of my biggest takeaways from that. He didn’t look special to me and I don’t know if that’s my own ego where I’m looking at Jon as this phenomenal, unstoppable puzzle like a lot of people do. 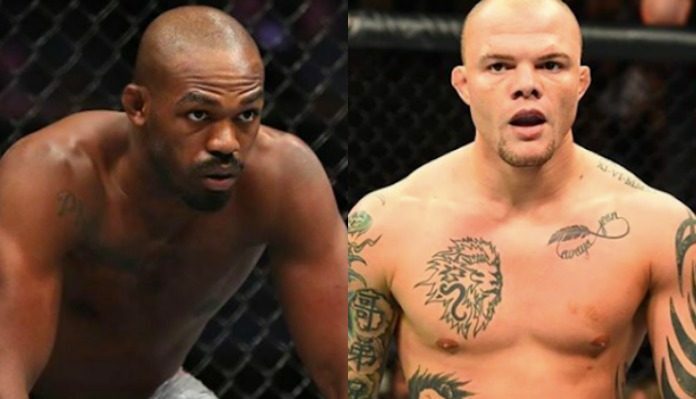 Does a fight between Jon Jones and Anthony Smith interest you?